HENLEY TOWN FC have appointed Jon Laugharne as their new manager. Laugharne and coach and therapist Darren Purbrick have both joined the Red Kites who were relegated last month from Hellenic Division 1 East side Finchampstead. He had been in charge at Finchampstead for six years and ended an 11-year association with the club to join Henley. Laugharne spoke to chairman Kim Chapman and secretary Tony Kingston outlining his vision for the side before being confirmed this week. Laugharne said: “We had a conversation, I’ve known Tony and Henley for a while and we talked about a few things. Henley finished bottom of the Premier Division with just four wins from 34 games, with manager Rob Creech and coach Andy Findlay leaving the club soon after. Laugharne said: “The Premier Division is a really tough league and to go up from Division 1 is really hard. “There are lots of really good teams and good players and it was really difficult for Henley last year. “This year we are hoping to bring stability on and off the field and grow the club as best we can. “I’m not going to make any claims that we will win the league and go straight back up but we want to give it a good go. The club is also looking for donations to help with its running costs. It was given grants to help upgrade its facilities in Mill Lane in order to play in the Premier Division this season and also wants to build a new £600,000 artificial pitch. Chairman Tony Kingston said: “During its 146-year history Henley Town Football Club has had many ups and downs, when it has come close to folding, but with the help of the local community the club survived. 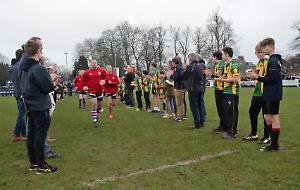 Unlike its wealthy counterparts, Henley Town doesn’t have big backers and is run by dedicated volunteers and exists almost entirely on fund-raising by members and income from the clubhouse bar. Donations can be sent to treasurer Mr G Biggs at 24 South View Avenue, Caversham, Reading RG4 5AD or direct into the club’s bank account using the account number 65210220 and sort code 60-10-35.